For years, Uptown residents have asked for a facelift for the deteriorating Wilson Red Line Stop. It will soon get much more than that. Ald. 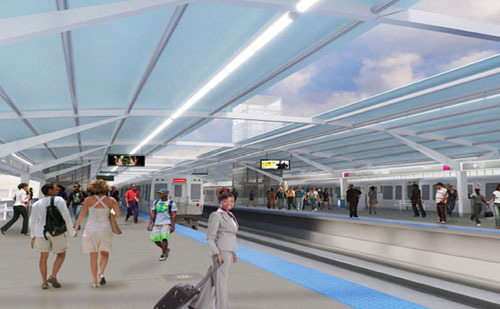 James Cappleman (46th Ward) hosted an open house meeting at Truman College Thursday to announce the details of a $203 million reconstruction project for the Wilson station that CTA officials hope will provide a template for other, similar projects. The project will shift Wilson's main entrance to the south side of Wilson Avenue, add a new entrance one block south on Sunnyside Avenue, provide handicap-accessible ramps and elevators, become a new connection for Purple Line Express trains as well as shift the Red Line track to eliminate a cumbersome overpass at Broadway Avenue. “This is what we see as the model for future stops,” said Kevin O'Malley, CTA general manager of Strategic planning. Local officials have been pushing for renovations to the run-down Wilson station for more than a decade. A surge of state funds moved the project into fruition this time around. The reconstruction is a part of the CTA's $1 billion “Red Ahead” program that will provide key updates throughout the Red Line. 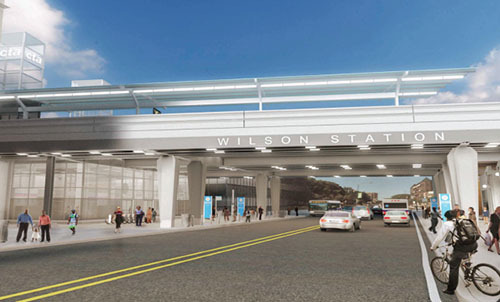 Over 80 percent of the funding for the Wilson project comes from the Illinois Jobs Now program, with the remaining funding coming from the Federal Transit Administration and tax-increment financing, according to the CTA. Officials estimate that the project will take 33 months to complete, with construction set to begin next summer. Because Red Line trains will have the ability to shift to Purple Line tracks, service closures will not be necessary during the work, unlike the five-month shutdown for the Dan Ryan branch of the Red Line starting next spring. Video vault: Uptown residents and others talk about the need for improvements to the Wilson stop. While Purple Line tracks will be in operation during the construction, Wilson riders will not have access to Purple Line Express trains until the project is complete. When that occurs, Wilson will be the only Red Line transfer-point between the Belmont and Howard stations. The new station will boast several access options for customers with disabilities, a feature that is entirely absent at the current stop. There will be two elevators and a handicap ramp that will extend to the southern entrance at Sunnyside Avenue. Garland Armstrong, who is on the CTA's American Disability Association advisory committee, is pleased with the plans for the new station. The ramp leading down to the station's southern entrance at Sunnyside Avenue will provide easy access to shops like Target and Aldi for commuters, but CTA officials hope that the new entrance will increase ridership at the station. The defunct Gerber Building will undergo heavy renovations as a part of this project, an effort that officials hope will allow for retail opportunities to open up in the location. Unlike Wilson Avenue, Sunnyside Avenue is secluded from busy traffic and could pose threats to the security of commuters using the new southern entrance. “We will light up and secure the areas surrounding the stop everywhere we have the ability to do so,” O'Malley said. The Wilson station was once the pride of Chicago's public transportation. This project seeks to return it to such a state, officials say. Video vault: See the poor conditions of the current Wilson stop.